Comunque io i tuoi set non li guardo più. Mi hai già fatto comprare la pelliccia azzura, ora mi devo comprare anche questa gonna! Non amo gli stivali marroni, ma il resto del look è bellissimo! 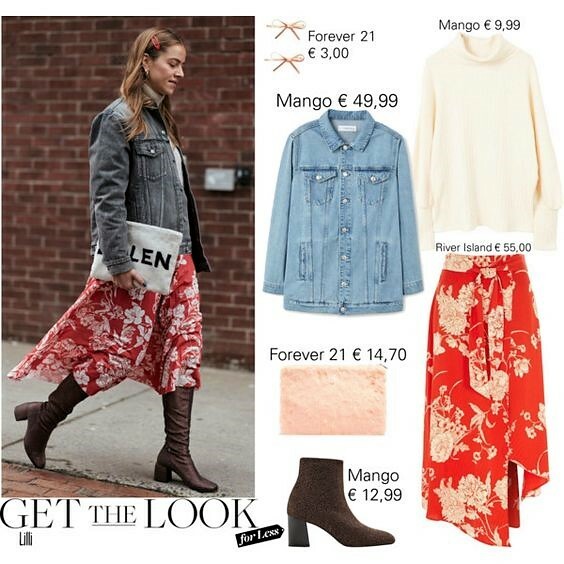 I like the mix of the red floral skirt with denim. Looks so cool and feminine. Blue and red are a perfect combination. this is such a cool outfit. I like flirty skirts with cozy sweater. Ant the denim jacket is just perfect for this Look. Thank you for this inspirtion. You are the queen of stylish and comfy looks Lilli! This outfit is exactly that and now I'm inspired to wear it as well. I think I may actually have similar components in my closet to recreate it now ;) Happy new week! Ah, great round up here of affordable options and I love this look too, casual and fashion forward at the same time. It is an ideal combination, I love denim jackets, they are a classic in the wardrobe that never goes out of style. I am loving that RI skirt. What a stunner. Especially paired with denim.